This model has been rebuilt by James Lawson (07/06/07) using differential equations to describe the reaction kinetics rather than using reaction elements. Several parameters and initial values were also corrected from Version 01. The concentrations for D (agonist) and R (receptor) were not stated in the paper and were set to 10^-8 and 10^-9 molar (reference: Nicholas Le Novere, BioModels). This file is known to run in PCEnv and will probably run in COR, although this has not been confirmed. Because of the nature of the figures presented in the paper, it is difficult to validate the output of this model. G-proteins, or guanine nucleotide-binding proteins, serve to couple receptors to membrane-bound enzymes such as adenylate cyclase. In turn this induces the generation of secondary messengers such as cAMP for purposes of signal transduction. 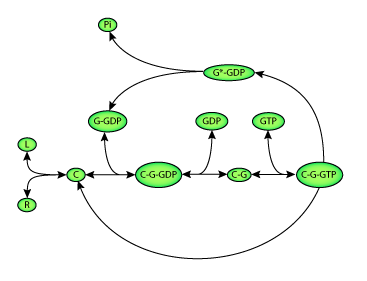 The inactive form of the G-protein consists of alpha, beta, and gamma subunits with a molecule of GDP bound to the alpha subunit. When a ligand-bound receptor interacts with the G-protein, it catalyses the exchange of GDP for GTP and activates the G-protein. The G-protein is then released from the receptor and it dissociates into separate beta-gamma and alpha-GTP (active) subunits. Active G-proteins are returned to their inactive state upon the hydrolysis of GTP to GDP by the intrinsic GTPase activity of the alpha-subunit and the alpha-GDP and beta-gamma subunits can recombine. (See the figure below). This description of a general G-protein activation pathway is based on the mathematical model described by W.J Thomsen and R.R. Neubig in their 1989 paper. The model does not include the steps of dissociation and recombination of the alpha and beta-gamma subunits of the G-protein. In addition, it is assumed that the number of membrane bound receptors (Rt) is constant. A rendering of a G-protein activation pathway. In CellML, models are thought of as connected networks of discrete components. These components may correspond to physiologically separated regions or chemically distinct objects, or may be useful modelling abstractions. This pathway model has 17 components representing chemically distinct objects (11 chemical species and six reactions) and one component for modelling convenience in which global variables such as time are declared. The CellML rendering of the G-protein activation pathway model is shown in (the different shapes in the diagram are explained in the notation guide). The action of a catalyst on a reaction is again represented by dashed lines. The CellML rendering of a G-protein activation pathway. Derived from workspace Thomsen, Neubig, 1989 at changeset c314203710fa.